Home » Copycat Restaurant Recipes » Menlo Park’s New Leaf Meatloaf – you can make restaurant tasting meatloaf at home, it is no secret on how to make meatloaf. Menlo Park’s New Leaf Meatloaf – you can make restaurant tasting meatloaf at home, it is no secret on how to make meatloaf. Menlo’s Park New Leaf Restaurant is located in San Jose, California. The meatloaf is the house specialty. 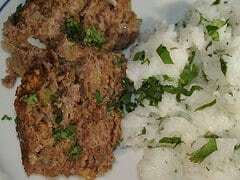 Menlo Park's – you can make restaurant tasting meatloaf at home, it is no secret on how to make meatloaf. Mix all ingredients except ketchup together and fill a loaf pan that has been sprayed with cooking oil. Press loaf tightly into pan and chill overnight.Cover surface with the 1/3 cup ketchup and cover with foil. Bake at 350 degrees for 2 hours. Slice into 9 slices and serve. You can always cater a recipe to your personal taste.